AP Govt. has announced that the students who are appearing Intermediate Examinations 2018 may download their hall tickets from the official website jnanabhumi.ap.gov.in. Inter 1st-year 2018 hall tickets, Inter 2nd-year hall tickets 2018 were formerly available @bie.ap.gov.in. 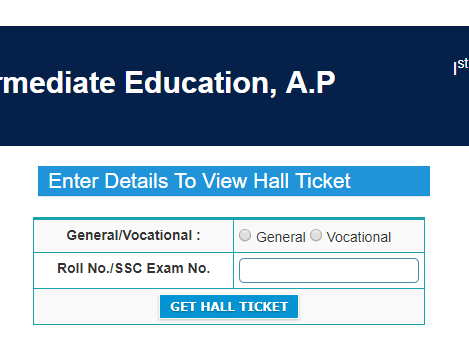 Now intermediate exam centers hall ticket number and ap inter practical hall tickets 2018 are now available at jnanabhumi.ap.gov.in. The Intermediate Exams for the first year will begin from February 28th and the Intermediate second year exams will start from March 1st. Step4: Enter your SSC hall ticket number or Roll no. Step5: Get your Hall ticket and take a printout for further use. 06-03-2018: Mathematics 1A, Botany 1, Civics 1, Psychology 1. 08-03-2018: Mathematics 1B, Zoology 1, History 1. 10-03-2018: Physics 1, Economics 1, Classical Language 1. 13-03-2018: Chemistry 1, Commerce1, Sociology 1, Fine Arts, Music 1. 15-03-2018: Geology 1, Home Science 1, Public Administration 1, Logic 1, Bridge course1. 17-03-2018: Modern Language 1, Geography 1. 07-03-2018: Mathematics 2A, Botany 2, Civics 2, Psychology 2. 09-03-2018: Mathematics 2B, Zoology 2, History 2. 12-03-2018: Physics 2, Economics 2, Classical Language 2. 14-03-2018: Chemistry 2, Commerce 2, Sociology 2, Fine Arts, Music 2. 16-03-2018: Geology 2, Home Science 2, Public Administration 2, Logic 2, Bridge course 2. 19-03-2018: Modern Language 2, Geography 2.